If interior design used to be mostly ‘Keeping up with the Joneses’, now it’s all about expressing your own personal style in a way the Joneses couldn’t possibly imagine. While eye-catching odds and ends of furniture can lend interest to a room, modern interior trends are increasingly leaning towards quirky flooring as a main focal point. From cosy tartan carpets to cute polka dot bathroom tiles, here are just some of the innovative brands we work with and their quirkiest styles. Game-changers in the luxury vinyl tile world, Harvey Maria’s range marries style with functionality and is both endlessly versatile and completely customisable. Vintage fans will adore these quirky tiles featuring Cath Kidston’s signature retro prints. Whether you choose polka dots or floral sprigs, these tiles are durable, easy-to-clean, slip-resistant, and compatible with underfloor heating – making them the perfect choice for bathrooms and kitchens in both domestic or commercial properties. British textile designer Neisha Crosland is renowned for her nature-inspired palettes and parquet. These geometric tiles are designed to be mixed and matched, allowing you to create a completely unique finish, while their durability, slip-resistance, and 25-year guarantee make them suitable for any room in your home or business. If you’re looking to add interest to your bathroom or kitchen, the beautiful hand-painted designs of Dee Hardwicke will provide the perfect organic touch. Hard-wearing and durable even in wet or humid conditions, these tiles are suitable for domestic and commercial use and can be mixed and matched, placed individually to brighten up plain tiles, or used in conjunction to create an eye-catching and alternative floor. If you love the idea of hardwood floors but don’t fancy the cost and the upkeep, these wood effect tiles are indistinguishable from the real thing while remaining water- and slip-resistant, durable, and ideal for use in both your home and business. The tiles come in 15 different wood types and colours, with each style designed to complement each other – allowing you complete creative freedom to style your own individual mix’n’match wooden floor. Experts in providing the highest quality carpets for the most affordable prices, Hugh Mackay is renowned for its fresh and stylish shades and patterns. Making a comeback on 2019’s interior design trends lists, tartan is the perfect way to add warmth and elegance to your home. Hugh Mackay’s Tartanesque range is great for both traditionally-styled interiors or quirky spaces, with ten different designs and colours. A genuine Axminster weave made with 100% undyed British wool makes these carpets perfectly soft underfoot in living rooms or bedrooms. If you’re looking for bright colours or something a little more geometric for your home, the Deco Stripe range has everything from chic monochrome designs to bold and beautiful multicoloured stripes. Made from 100% British wool, these striking carpets are hard wearing enough for use all around the home, from dining rooms to staircases. Follow us on Pinterest to share and save your favourite alternative flooring ideas, or contact us to find out more about the innovative styles we stock and organise a free measuring of your home. Need a little more inspiration? Here’s some of our favourite quirky flooring on Pinterest. This clever minimalist design is great if you’re working with a smaller room or just want to add a little definition to an open plan living space. Stairs can often be overlooked when it comes to interior design – use yours to add interest with a quirky striped carpet. Stripes don’t have to be big and bold to make an impact. This thin stripe adds texture and a chic nautical vibe without being overbearing. If you want to floor a whole room with quirky tiles, it can be a good idea to use muted natural tones like this earthy terracotta to avoid making the space look too busy. 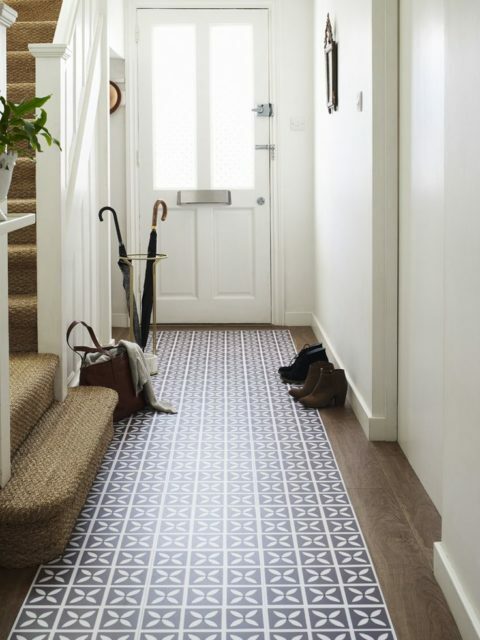 Patterned vinyl tiles aren’t just great for livening up a plain floor, they can also be a much more durable and long-wearing option for heavy traffic areas like a hallway. The key to making a statement floor work is all in the detail! If you’re going to go bold with your choice, make sure to tie the room together with matching accessories.